Porsche celebrates a very special anniversary at the 24-hour race at the Daytona International Speedway: It is 50 years since Vic Elford, Jochen Neerpasch, Rolf Stommelen, Jo Siffert and Hans Herrmann, at the wheel of the 907LH (Longtail), claimed the first of 22 overall victories for Porsche at the world-famous endurance race in Florida. As the most successful manufacturer in the history of this prestigious race, Porsche will once again be strongly represented at the 56th edition on 27th/28th January. The Porsche GT Team will field two 911 RSR at the opening round of the IMSA SportsCar Championship. 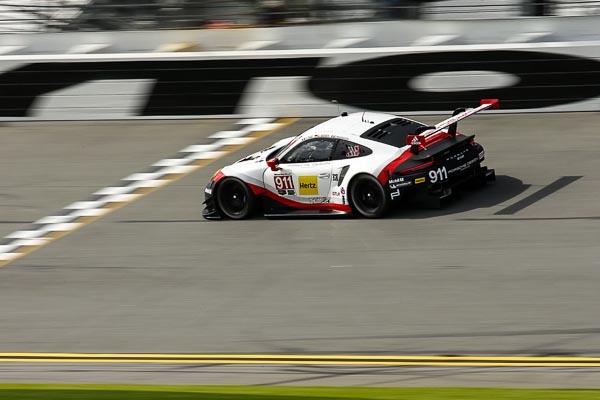 The number 911 and 912 cars from Weissach will face stiff opposition from BMW, Chevrolet, Ferrari and Ford in what is traditionally the most fiercely-contested category – the GTLM class. Three 911 GT3 R will be run by Porsche customer teams in the GTD class. In total, nine works drivers and two Young Professionals will be in action for Porsche. The 24 Hours of Daytona is the first highlight of the 2018 motorsport year. Porsche has expanded its global commitment to GT racing this season, and has made organisational changes to allow this. Pascal Zurlinden takes over from Marco Ujhasi as the new Director GT Factory Motorsports. His predecessor will work closely with Porsche Digital GmbH in the future in his role as Project Manager Digitisation Motorsport. Sebastian Golz takes over project management of the 911 GT3 R, including works-assisted outings in the Intercontinental GT Challenge, Blancpain Endurance Series, and the Nürburgring 24 Hours. Daytona is the heart of US motorsport. Together with Le Mans, the 24-hour race is one of the most famous endurance races in the world. 50 cars, with drivers from a wide range of global racing series, will line up at the 5.729-kilometre Daytona International Speedway – an ultra-modern motorsport arena with two steep, fast bends and a tight infield.